Intravascular ultrasound (IVUS) is a diagnostic test. This test uses sound waves to see inside blood vessels. It is useful for evaluating the coronary arteries that supply the heart. A tiny ultrasound wand is attached to the top of a thin tube. This tube is called a catheter. 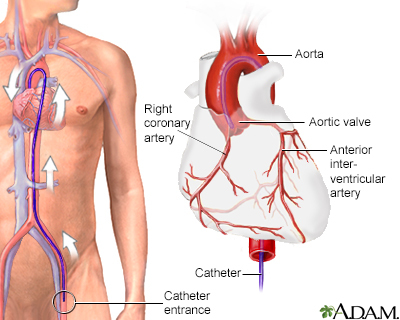 The catheter is inserted into an artery in your groin area and moved up to the heart. It is different from conventional Duplex ultrasound. Duplex ultrasound is done from the outside of your body by placing the transducer on the skin. A computer measures how the sound waves reflect off blood vessels, and changes the sound waves into pictures. IVUS gives the health care provider a look at your coronary arteries from the inside-out. Angiography gives a general look at the coronary arteries. However, it can't show the walls of the arteries. IVUS images show the artery walls and can reveal cholesterol and fat deposits (plaques). Buildup of these deposits can increase your risk of a heart attack. IVUS has helped providers understand how stents become clogged. This is called stent restenosis. IVUS is commonly done to make sure a stent is correctly placed during angioplasty. It may also be done to determine where a stent should be placed. There is a slight risk of complications with angioplasty and cardiac catheterization. However, the tests are very safe when done by an experienced team. IVUS adds little additional risk. After the test, the catheter is completely removed. A bandage is placed on the area. You will be asked to lie flat on your back with pressure on your groin area for a few hours after the test to prevent bleeding. Cardiac catheterization: You will stay in the hospital for about 3 to 6 hours. Angioplasty: You will stay in the hospital for 12 to 24 hours. The IVUS does not add to the time you must stay in the hospital. Honda Y, Fitzgerald PJ, Yock PG. Intravascular ultrasound. In: Topol EJ, Teirstein PS, eds. Textbook of Interventional Cardiology. 7th ed. Philadelphia, PA: Elsevier; 2016:chap 60. Yammine H, Ballast JK, Arko FR. Intravascular ultrasound. In: Sidawy AN, Perler BA, eds. Rutherford's Vascular Surgery and Endovascular Therapy. 9th ed. Philadelphia, PA: Elsevier; 2019:chap 30. 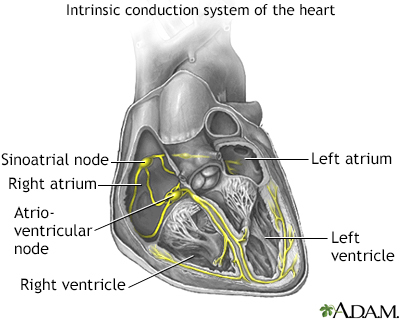 The intrinsic conduction system sets the basic rhythm of the beating heart by generating impulses which stimulate the heart to contract. 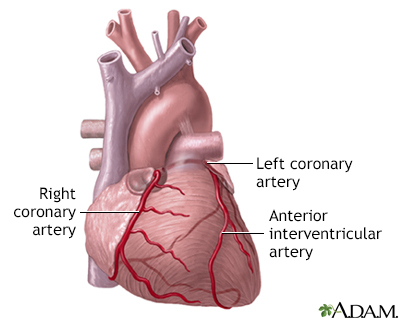 Coronary angiography is performed to detect obstruction in the coronary arteries of the heart. During the procedure a catheter (thin flexible tube) is inserted into an artery in your arm or groin and then threaded carefully into the heart. The blood vessels of the heart are then studied by injection of contrast media through the catheter. A rapid succession of X-rays (fluoroscopy) is taken to view blood flow.